Bridge Kitchenware is selling off some pandoro molds. The large one, 16 cup (1-1.2 kg dough) is $10.80. The sale prices are good until the end of week; whatever that means. The shipping charge makes buying 1 unreasonable, 2 is so/so, 3 or more is better. I got a bunch of these two years ago when they were at sale. $2.50 for 2 because no one knew what they were! I also hold church sales, thrift stores and the like in very high esteem. I just bought two Pullman pans and a most awesome pan that I am not sure what to call, but it makes six five inch I will use it to make mini black cakes for Christmas, and mini pannetones. All 3 pans are heavy, really nice pans, used but no rust or damage....are you ready? $1.50 the lot! People get gift or try a recipe once then never use the item again! Clay bakers are everywhere here. Peter, Thanks for the links. Thanks for the links. Their prices beat Fantes prices....Not sure what size to order for a 500g (about a pound) loaf would be. I am thinking the large one you bought is tooo big. Did you purchase all the same size. Do you know where are these pans are made? What kind of metal is used? I measured the large mold and its volume is indeed 16 cups making it a kilo mold. I found them to actually be in the 1100-1200g range using the pandoro formula in Maggie Glezer's Artisan Bread Baking (below). This formula mixes the butter in on the last step and the dough is more batter like than I want. I am going to try one of Iginio Massari's formulas next and have also dug up some laminated dough formulas off the web, too. I expect that the doughs will support themselves better allowing them to proof well over the top of the mold and yield a more "shreddable" crumb. They should also be closer to 1000g of dough in the mold. The molds are made out of sheet aluminum. They must be buttered and floured, the bead surface is not as nice as that from a teflon mold. I am going to try a baking spray next; I think a thinner fat/flour film will be better--and easier. I don't know where the molds are made, but they look like ones advertised for sale on Italian bakeware websites. Teflon coated molds are probably the best (albeit prohibitively expensive) and I read some Italian baking blogs that recommended avoiding the all silicone rubber molds. I also bought a couple of the 5 cup molds. They should be in the 300-350g of dough range. Bridge did not have any of the 500g (8 c) molds for sale. Thanks for the information. I ended up calling Bridge yesterday. The woman didn't know about sizes but said most order the 16 cup mold. I ordered only one of those and several of the 5 cup ones not sure how much they would hold so I am relieved to read that I guessed just about right based on your response above. (I prefer doing several smaller than one large but now I have both and am glad it was the smaller one that I did order in quantity.) The woman said they are made in Italy which means they are the better quality ones. A great deal on these and hard to pass up. Thanks on the comments about the different formulas too. I have been looking at Maggies and now will check out the other one you mention which, I think, is the one Michael uses. I will pay attention to when the butter is added. I didn't know it made a difference and I usually hold back the butter if it is a large amount so the gluten has a chance to form a bit first. What difference do you find in adding it earlier on? Thanks again for the response and the link to the web site for the pans. before the butter goes in. Pandoro formulas have little to no added water, fat (from several eggs and yolks) and a lot of sugar (which competes with the flour for the water); all of which inhibit gluten development. If you undermix the dough before the butter goes in, it is almost, if not entirely, impossible to sufficiently develop the dough. As I recall, Glezer does not give individual mixing times but says that all the steps take about hour in total. It doesn't develop quickly and looks like it is going nowhere to start, so stay on it. I found that it took about 15-20 mins at each stage with my Kitchenaid k45ss using the dough hook and scraping down the sides every couple of minutes; the paddle did not do the job. Glezer's formula has everything going into the mixer with the whipped butter being added last. The laminated dough formulas are very similar to croissants where the butter is incorporated (last) by lamination. I think this route will afford better gluten development. I did not mean to imply that the butter should be added at any stage other than the last. All the formula's I found specified a high-gluten flour. I had some Guisto's Organic Ultimate Performer that was given to me and would recommend it without reservation especially to those on the west coast that can easily get it. When it's gone, I'm going to try some locally available high gluten flours and even some bleached ones which, if I have my facts straight, can be stronger than their unbleached counterparts. Glezer and others call for cocao butter which is not often readily available at retail. Most cocao butter is food grade even that used in cosmetics; any food grade cosmetic cocoa butter will be ok as long as it is 100% cocao butter with no additives. I found it at Whole Foods where they sell it boith in their nutritional additives and cosmetic departments. The former was more expensive and only available in 1 lb packages. I bought the NOW brand cocoa butter found in the cosmetic section; it was still expensive IMO, but available in a 7 oz container. A little goes a long way. Thanks for the pointers. I will pay close attention and not panic when things take longer to develop. I am working on challahs this week and there are a lot of eggs in the formula. It is one that takes quite a bit of kneading but things do come together and by morning the dough is really nice and a lot stronger and easier to shape. 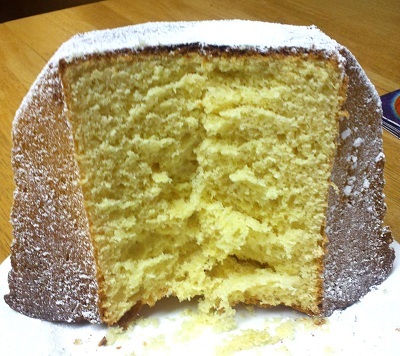 I wanted to give Glezer's pandoro one more chance and so I made it again this past week with very good results. This time I made sure the first and second doughs were thoroughly developed including hand kneading the latter after machine mixing (10-12 mins & before adding the bulk of the yolks) until it was very smooth and strong. Adding the rest of the yolks to the fully developed dough was messy; it helped to pull the dough off the spiral hook and break it up somewhat to help incorporate the yolks. Otherwise, the dough would ball up on the hook and just slop around in the liquid. The dough becomes sticky and lumpy over time as the added yolk is worked in, continued mixing brings it to a sticky, stringy very soft dough, somewhat batter like as before, but clearly more devedoped this time. Last, I used the two 5 c molds that I bought from Bridges and put the excess into a small fluted jello aluminum mold that we have. Noticably, the jello mold bread baked to a nicer more even (and desirable) brown than those in the Bridges molds (including those from prior trials). The major difference that I can see is the jello mold has a matte finish. I suspect that the very shiny surfaces of the Bridges molds reflect enough energy to significantly slow the baking process. I'll test this eventually by dulling the surface of one with some steel wool. I've also been covering the tops with aluminum foil (shiny side up) for 1/2 the bake time to keep the tops from burning. The result was a very acceptable, tasty and quite shreddable crumb pandoro. I have been baking an assortment of holiday breads that use lots of eggs and egg yolks. What I have ended up doing is adding them with my liquid ingredients at the beginning of the mix and then mixing in a portion of the flour. I then let it all sit for about an hour. Much easier this way. I add the butter after the gluten has developed a bit and do that in stages based on how smoothly it is being worked into the dough. Thanks for the words on how the pans bake. Mine haven't arrived yet. They were swamped with orders when I ordered mine. So, I scuffed up the outside (haven't baked with it yet...) and, yes, I have been buttering the inside and dusting it with a minimum of pastry or cake flour. For the heck of it (and because email is so easy), I contacted Maggie Glezer (Artisan Baking, 2000 and a BBGA member) and asked her for her comments about the consistency of the second dough . She replied that Pandoros need a very active starter. IIRC, mwilson has previously mentioned this and that fermentation temperatures and times are very important. The starter is not just a leavening agent, but is also a dough modifier. Having a starter with a relatively lower acetic acid fraction will (should?) enhance gluten development. Massari specifies that the starter be refreshed and fermented at 27-28 degC. I thought that this was done to facilitate a shorter turnaround, however, I now believe that it is also desirable because it yields a reduced acetic acid starter. Peter, here is the proofing box I made last winter using a reptile terraruim and ceramic heat lamp. Works great. I have to space to leave it out all of the time but if you con't have space coolers work great too. Lots of ideas here to build on. I keep my leaven builds short to keep them 'sweet' all the time because I use whole grains in them. Short = strong yeasties and less sour because the lag time for the LABS is longer. Bread baking can take on whole new dimensions :-). MWilson make a wonderful looking Pandoro and I know he has been perfection his over time. Yours looks good too. Always fun to learn new stuff. Your correct in thinking that the warm temps are to reduce acetic acid. The processes involved in panettone production always serve to keep acetic acid to an absolute minimum. Acetic is undesirable for two main reasons. One the sour taste is undesirable and two it hinders yeast growth. As Janet has said the feeding at short intervals ie. every four hours, is to reduce the LAB population and therefore reduce overall acidity (lactic and acetic). - Too much lactic acid is also undesirable. I encourage you taste your starter after every rise. Acetic acid is very sharp tasting and you can smell it. Lactic however barely has a smell and tastes fizzy, like sherbet. Temperature control is key to success. Well, the molds arrived so yesterday was Pandoro day. Followed MGs directions and mixing the final dough was a bit of a challenge as you mentioned in getting the ingredients into one cohesive whole but it did come together. I had to add extra flour because I used honey instead of sugar as the sweetener. DOugh was divided and placed into 2 pans and it rose quite quickly which I attribute to the whole grains I use. Lots of food for the yeasties. Ready to bake when I got up this morning. All went well. Sorry no photo. One loaf went to friends and the second went with my daughter when she headed out to visit some of her friends. She did take a slice and pronounced it delicious and shreddable soft. She couldn't detect the cocoa butter. Could you taste it in your loaves? I wonder if it is necessary. Anyway, thanks for all you contributed to this bake and all that I have gleaned from making it. P.S. I didn't have trouble with the molds. Buttered them really well but not with melted butter as she suggests. One loaf stuck a tiny bit but the other loaf popped right out. Washing them is a challenge due to the tight creases. The laminated dough formulas are very similar to croissants where the butter is incorporated (last) by lamination. That would be an awesome pandoro. 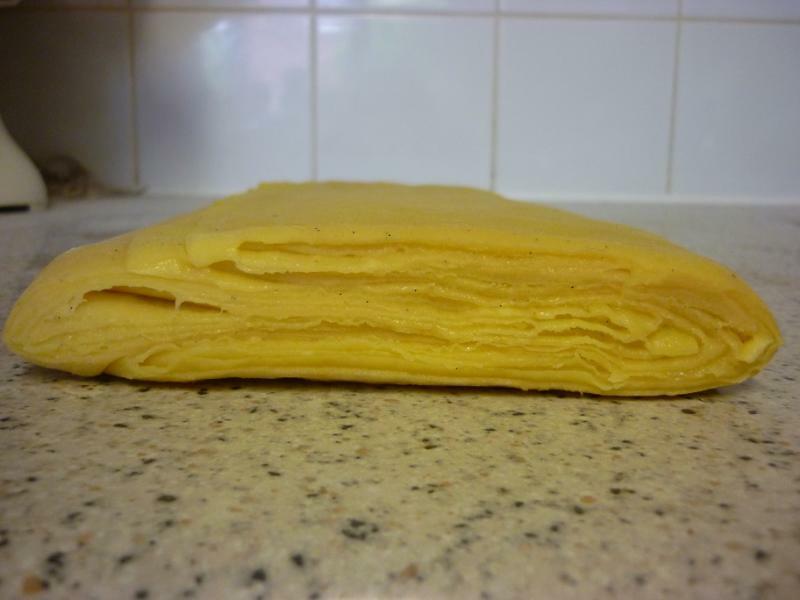 There is a recipe in Cresci called "Flaky Pandoro" which uses lamination. 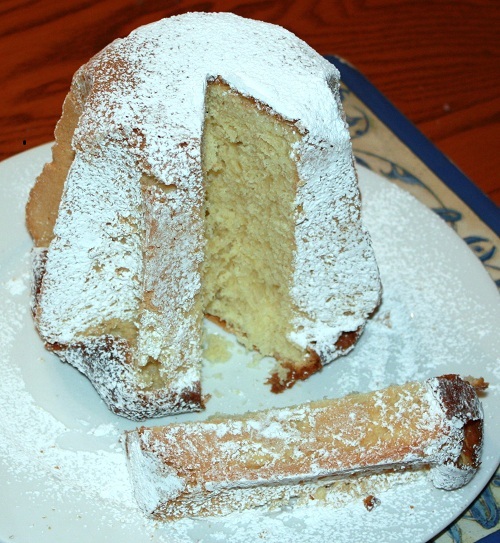 The pandoro in this picture comes from the book. Here's a picture of the laminated dough I made. That's interesting. Are you suppose to shape that into a round? Yep. How, I don't know! This is another thing that isn't entirely clear in this book. Fascinating. Is this dough at all similar to the "typical" pandoro dough or is it only a pandoro due to the mold shape? I can't imagine laminating a runny pandoro dough. Yes, the dough itself contains fairly high percentages of sugar, honey, eggs and butter. It is chilled during lamination, is much firmer and performs beautifully. To make things difficult though it's a combination of butter and icing sugar beaten together that is used for layering. 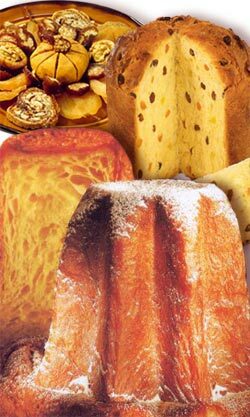 I would like to add that pandoro or panettone doughs are soft, sometimes very soft but should never be runny. If it's runny something is wrong. If your dough did not rise, maybe it was spent. Which formula did you use for your laminated dough, did it have added baker's yeast? The laminated dough is shaped by tucking the corners under and shaping it into a boule. Runny doughs are probably under mixed. The gluten has to be highly developed early on before the bulk of the fat (butter & eggs) and sugar are added. I suppose overmixing could give a sloppy dough, too, but given the mixing times that I've experienced, that is unlikely. Are you addressing me? Me? Do you not know my reputation? Are you not aware of my achievements? My attempt at Flaky Pandoro was long ago and I already know why it didn't work. There is no other amateur that understands this subject and the book Cresci better than me. Sounds like someone has their knickers in a twist. I apologize that it wasn't obvious that I was responding to yy's post and, with regards to the former, a simple link or two would have sufficed. Not to worry, your self appointed status on the high horse is secure. by filling the mold with water . The texture was light and fluffy and shredable. lamination right. In my case it it still a bit irregular. The book Cresci is definitely on my holidays wish list. Thank you Michael for sharing this picture. is a beautiful book, but be advised that the English language translation of the formulas is not always clear. Thanks Peter, I was wondering about that translation thing. 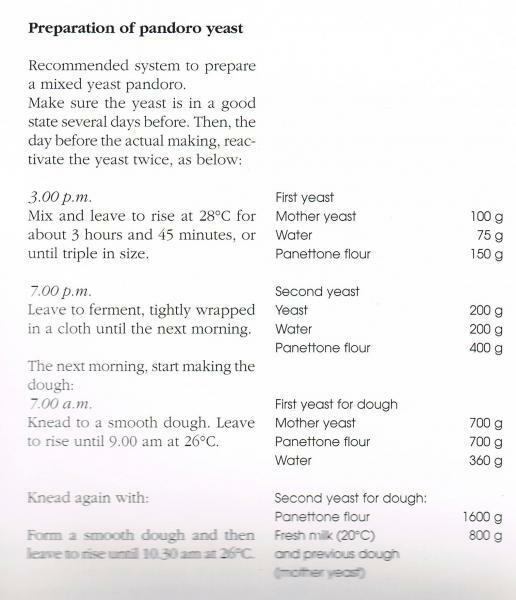 In this case the mother yeast in the first step is a starter. The yeast in the second step is the build resulting from the first step. Further steps are more confusing. Don't expect to grab this book and start baking immediately, you'll have to spend some time working through the formulas in advance. Thanks Peter, I see what you mean: requires study and planning ahead of time. Oh yes, I see what you mean Peter, - it really sounds quite alchimistic. 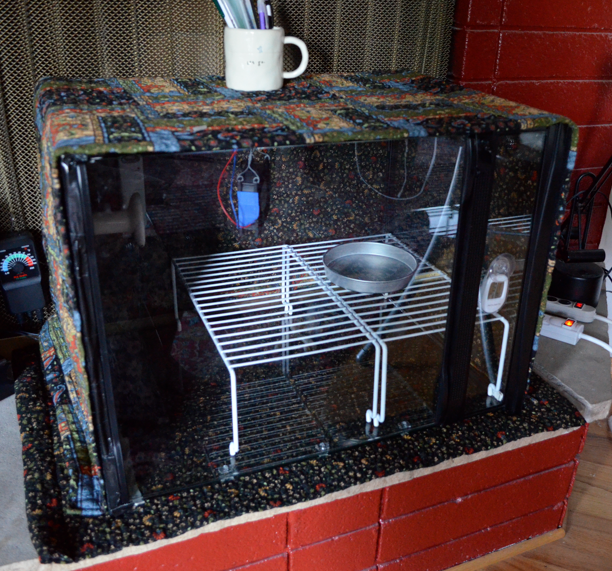 Those wanting to make things from Cresci need specific temperature control - I use an aquarium heater. Cresci is really intended for professional application and not home bakers. Italian baking is super advanced!!! To think, that the process, still used today to make pandoro from natural yeast was patented in 1894 is seriously admirable. Those Italians, they certainly know something about natural fermentation..! They are the masters of baking.